Light bounces off everything we see. It then passes through an elaborate configuration of structures (parts of the eye) designed to bring that image to focus on the retina at the back of the eye. 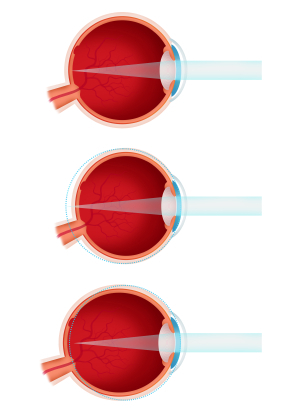 When light entering the globe passes through the various parts of the eye and comes to focus right on the retina, the patient requires no vision correction and the form will be blank. Usually termed “farsightedness.” Generally, this condition is noted by a lack of really clear vision at distance and near. However, the hyperopic patient, with some effort can often focus acceptably far away, in the distance. In this eyeball light focuses behind the retina. 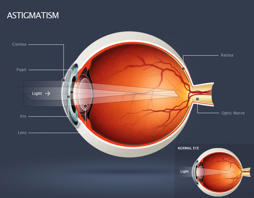 There is a lens (parts of the eye) within the eye that is used to add extra magnification for reading. Most farsighted people can use this lens to sharpen their distance vision. As this lens weakens, the doctor will prescribe magnifying lenses, written with a plus sign preceding the first number of the prescription (#1 on the form), to sharpen vision. Commonly called “nearsightedness,” this refractive error means that the patient can see well up close, within arm’s length. But, that vision is blurred in the distance. This is usually caused by the front of the eye being too strong (refractive myopia), or the eyeball being elongated (axial myopia). Both circumstances lead to light entering the eye coming to focus in front of the retina. A minifying lens, signified by a minus sign preceding the first number on the prescription pad (#1 on the form), focuses that light onto the retina, sharpening vision. The clear window at the front of the eye is called the cornea. If it is the same curve in all directions, like a baseball, we call it spherical. If it is steep one meridian and flat in another, like a football, it is called astigmatic. Toric is Latin for “two curves.” We use a toric lens aligned with those two different meridians to sharpen vision. Astigmatism often compounds myopia or hyperopia, and in even modest amounts is designed into eyeglass lenses to sharpen vision. The amount of this correction is written in the second box of the prescription pad (#2 on the form), and its orientation is defined by the third box (#3 on the form). The aging eye has difficulty focusing up close. After being bent by the cornea light coming from objects closer than twenty feet away needs to be concentrated further in order to focus on the retina. The lens within the globe changes shape to provide this extra power. This lens is a multi layered structure very similar to an onion. Throughout life new layers are added. With time the center of the lens becomes further removed from its nutrients and it starts to harden. Ultimately, it will not flex enough to provide enough magnification for reading, and the patient will require reading glasses or multifocals. This additional power (ADD) is recorded under your near correction on the prescription pad (#5 on the form). Special light bending characteristics included for muscle imbalance. Represented by an amount and a direction entered into the final box on the prescription form (#4 on the form).